After we rented a camper through Goboony, we were so excited that we bought a camper. 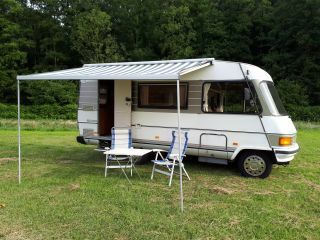 It has become a Cristall Winner: a nice semi-integral camper with 2.8 diesel engine, 128 hp. The camper has a French bed, shower, toilet, sink, oven, large fridge with separate freezer compartment, swivel chairs, a Maxxfan above the bed and air conditioning while driving. Cooking and heating (possibly the fridge) is done on lpg. Handy, because this is available at petrol stations in every country, so you never come without gas abroad! Of course, the camper is fully equipped with kitchen utensils, a table and chairs for the outside and a dish to cook outside. 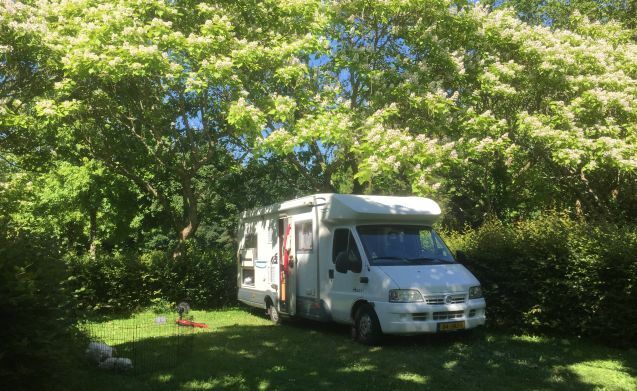 In short, a complete camper for a wonderful holiday, with pets being consulted. Our camper also loves to winter in hot countries! We trust that our tenants use the camper as if it were their own property. 1.Read more of this nice camper. 4. 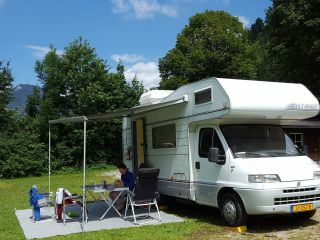 You will get a fully equipped camper, also with full tanks of diesel and lpg. 6. We want to clean the camper as soon as you get it. The outside of the camper does not have to be cleaned, we do it ourselves.